Home » Latest Gadgets , Latest Smartphones , Realme 2 features , Realme 2 launch , Realme 2 price , Realme 2 release , Realme 2 review , Realme 2 specs , Realme smartphone , Smartphones » Realme 2 smartphone - will it meet or exceed the expectation? Realme 2 smartphone - will it meet or exceed the expectation? After the flagship and success of first smartphone Realme1 from Realme, a sub-brand of Oppo, many questions about the next phone from the brand. Yes. Realme 2 to be launched exclusively on Flipkart on Aug 28, 2018. In this time, the question comes like will Realme2 smartphone meet or exceed the expectation? Will it give better specs or pricing compare to its own and rival? Since the first phone, Realme1 was blockbuster thus many questions about the upcoming one. So far unconfirmed Realme2 features, specs and price detail seems pretty well and hope it would continue to do so. However, we have to wait and see it's official announcement soon to make sure that whether Realme2 smartphone meet or exceed the expectation like a disruptor again as same as Realme1 or otherwise? We got some leaks about this phone like its key features, pricing, technical specification and rumors etc. You can check them and possibly it could match the official info on 28th August 2018 while launching it. 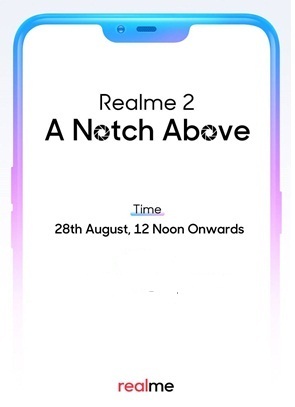 Realme 2’s teasers will be ‘A Notch Above’ with sub-10k price segment. It will have brand’s trademark diamond cut designs for the Diamond Red, Black and Blue variants. The phone may release with Qualcomm or MediaTek processor which we have to wait and see on this. As per the sources available, the phone might come with Dual rear camera setup and a rear-mounted fingerprint sensor. We can expect better specification and features in the device compare to Realme 1 phone. And, considering the price, it may have little less specs too, so, we have to wait and observe it. Realme 2 will also have a 4,230mAh cell that is more than 20 percent larger for earlier one when compare. It is an exclusive e-commerce brand with a range of devices that are ‘Made for and in India’. The device will be available to book on Flipkart on the same launch day. We would cover more detail on this gadget, so, stay tuned. Realme 2 price: Approx under 10K (will be updated). Tips: You can buy Realme2 and enjoy it with full satisfaction.